April 22nd is Earth Day! It serves as a reminder to be kinder and more mindful of our planet. Whether that means using less water, turning off lights, or carpooling, there are simple ways to help the environment. However, going green doesn’t just apply to us as humans; it also applies to us as dog owners. If you want to live a greener life, it’s important to include your pets in the process. In honor of Earth Day, here are seven eco-friendly ways for you and your dog live greener lives and reduce your impact on our home planet. While it’s common for people to just use a regular plastic bag to pick up dog waste, it can actually be harmful to the environment. When you throw out that doggy bag, it ends up in a landfill where it could take hundreds of years for it to biodegrade by itself. In addition, the dog droppings cannot decompose naturally if they’re stored inside a plastic bag. The best solution to help our environment is to buy biodegradable dog bags. Also, remember you should always pick up your dog’s waste no matter what–firstly because it’s the law, but secondly because it can pollute water supplies with diseases such as E.coli and salmonella. You can buy Bio Bag dog waste bags on Amazon here! Most of our dogs love all things toys; there’s no denying that. While you probably already have plenty of toys around the house, you should consider adding some recyclable toys to your dog’s toy collection. Not only will they reduce your impact on the environment, but your dogs are sure to love them. The video above gives you a few examples of great eco-friendly dog toys, such as a frisbee made with all natural dyes that’s ethically sourced, and even elk antlers, which naturally shed, so they’re completely earth friendly. This is the perfect item to get for those hot summer days when your dog cannot stop panting and nothing seems to be able to cool them off. You don’t need to blast the AC or use electricity at all. This cooling pad works when pressure is added. When your dog lies down, the cooling effect takes place immediately. It’s entirely eco-friendly and non-toxic. It stays cool because it’s filled with a cooling gel, so even if there’s a power outage, your dog will still be able to stay comfortable. 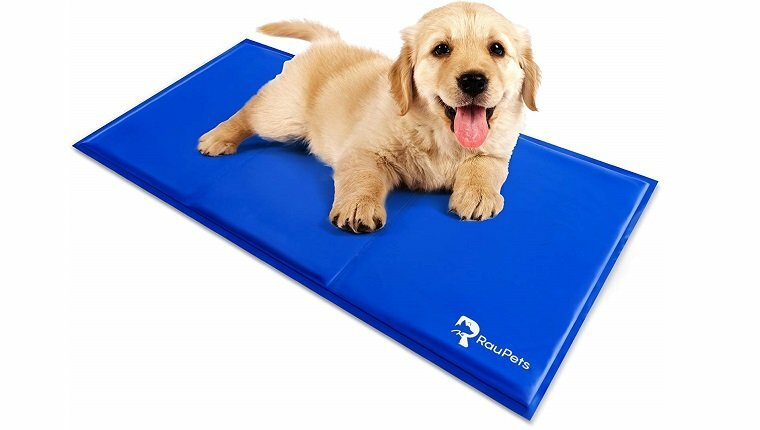 You can buy an eco-friendly dog cooling pad on Amazon here! For people with senior dogs, dogs with disabilities, or dogs who are still potty training, reusable and washable diapers or belly bands are a great solution. Not only do they save you money and the hassle of having to restock diapers and pads every week, but they’re also an eco-friendly alternative to stop the piling up of waste in landfills. Washable dog diapers and belly bands are made differently for female or male dogs, so make sure you get the right kind for your pooch. They’re great for dogs with incontinence issues or those who feel they need to mark when they’re in a new place. The best part is that there’s nothing to throw away! Just wash and reuse. You can buy washable diapers for female dogs on Amazon here! You can buy washable belly bands for male dogs on Amazon here! Cycle Dog was started in 2009 after Lanette Fidrych, who is a devoted bike rider, kept getting flat tires. She didn’t want to have to keep throwing out the old bike tubes, so she decided to make dog collars, which then turned into a whole business. A decade later, the company’s products are still made from recycled, eco-friendly materials. Not only are the collars long lasting and durable, but they are a great way to reduce you and your dog’s carbon footprint. The company also has a range of eco-friendly products from toys to beds on their website. Something as small and simple as buying a dog collar can still have an impact on the environment. You can buy Cycle Dog collars here! While there are plenty of recyclable toys on the market, a fun way to go greener is a DIY project. The video above shows you how to use old jeans and t-shirts to create pull rope toys for your dogs. While you can, of course, buy eco-friendly products, which is a great way to be more environmentally friendly, DIY projects are great because you can use products that you would otherwise throw out or give away that might end up in a landfill for years. Plus, your dog will appreciate the extra effort you put into it! Most dogs go nuts at the mere mention of a “walk.” Of course, you want to make sure your pup stays hydrated when they put their paws to the pavement, so you probably bring along a supply of water for some of those longer, hotter walks. Instead of relying on disposable plastic water bottles that can leach chemicals into your dog’s water and then sit in a landfill, get a safe, reusable water bottle, instead. It’s best to go with a stainless steal or silicon option that you can use for years without worrying about harmful chemicals. The water bottle above is stainless steal and comes with a silicon bowl-like attachment. Nice and convenient! 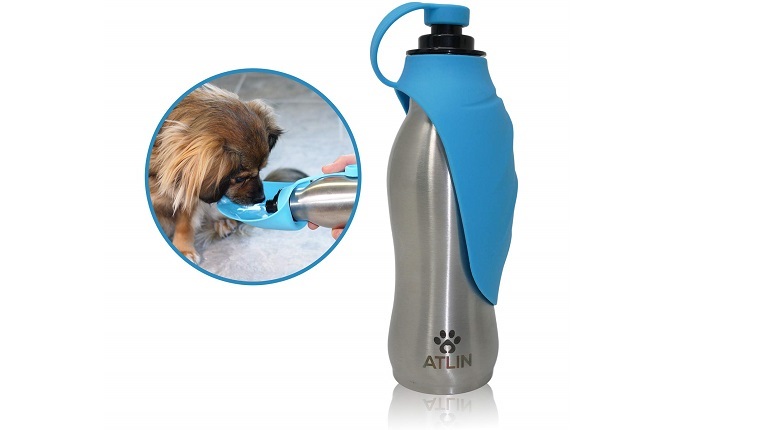 You can buy a reusable dog water bottle on Amazon here! 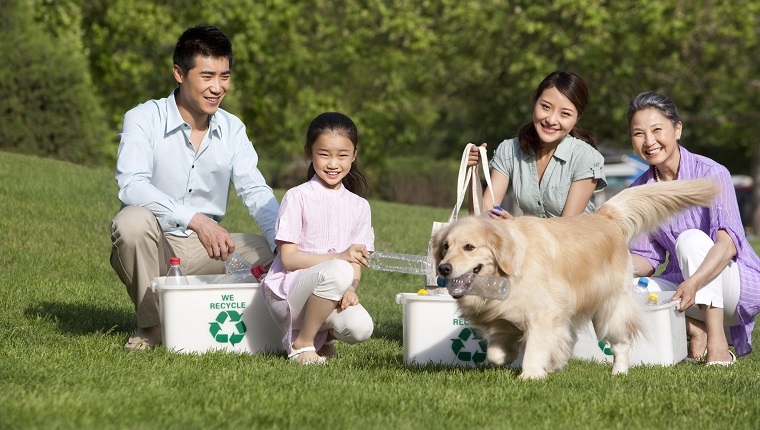 How do you and your dog live a more eco-friendly lifestyle with your dog? Do you have any tips in honor of Earth Day? Let us know in the comments below!